Today is non-farm payrolls day so we are NOT initiating any new #2 trades but there’s no doubt that the dollar is strong going into the jobs report. Instead, we’ll be LIVE trading NFP starting 8:15AM NY Time / 12:15 GMT. With USD/JPY racing to a high of 113.85 overnight, investors have completely forgotten about yesterday’s softer ADP report. This sentiment is shared by bond traders who have taken yields slightly higher this morning. A lot is at stake today -- if non-farm payrolls miss, Yellen’s credibility becomes a serious issue and investors will dump dollars ahead of her semiannual testimony on monetary policy and the economy next week. If they are strong, USD/JPY should break 114 and hit its 2 month high of 114.37. After yesterday’s strong move, euro is hanging tight ahead of NFPs. If it dips, we’ll be looking to buy. The worst performing currency this morning is GBP, which was hit hard by softer data. As we said when we laid out our -GBP #1_easy_2follow_trades, data is not confirming the hawkish rhetoric of BoE officials. Further losses are likely, but we’ll have to see how NFPs fare first. Canada will also be releasing its labor market numbers this morning along with IVEY PMI later in the day -- these numbers will shape expectations for next week’s Bank of Canada meeting. 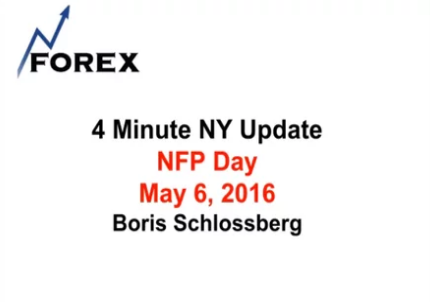 BK VIDEO NY Open 4 Minute Update 04.06.2015 Did NFP Kill Fed Hike?